We’ve quoted Steve Chapman previously here at Left-Handed Complement (here and here, for example). He’s on the editorial board of our home town paper, the Chicago Tribune, and writes for Reason magazine. Pretty conservative guy in a very conservative environment. But, left-handed as I am, I find myself agreeing with Chapman surprisingly often. Mitt Romney is worried about religious intolerance. He fears religious and nonreligious people will unite to punish him because of his Mormon faith. He thinks it would be much more in keeping with America’s noblest traditions if Mormons and other believers joined together to punish people of no faith. On Thursday, Romney showed up at the George H.W. Bush Library in College Station, Texas, to announce that even if it costs him the White House, his Mormonism is non-negotiable. That came as a relief to those who suspected he would defuse the issue by undergoing a Methodist baptism. Like John F. Kennedy, who said in 1960 that the presidency should not be “tarnished by arbitrarily withholding its occupancy from the members of any one religious group,” Romney said there should be no religious test for this office. “A person should not be elected because of his faith nor should he be rejected because of his faith,” he said. Chapman continues by illustrating Romney’s misreading of U.S. history and the intent of the authors of this country and its Constitution. Now, as much as MUDGE is likely to cast a vote next November for a Democrat, one imagines that Steve Chapman will not. In the end, though, Romney accomplished what he set out to do in this speech. Henceforth, no one can possibly justify voting against him because he’s a Mormon. Not when he’s provided so many other good reasons. NEWPORT, Ore. — Chris Martinson and his fellow fishermen catch crab and shrimp in the same big swell that one day could generate an important part of the Northwest’s energy supply. Wave farms, harvested with high-tech buoys that are being tested here on the Oregon coast, would strain clean, renewable power from the surging sea. They might make a mess of navigational charts, too. A hot-button topic, alternative energy sources have appeared in this nanocorner of the ‘Sphere© several times (wind power here, hydro power here). The concept of using living natural processes (rather than fossilized ones) is intriguing. But, as seen in the wind power story we discussed, even the free wind isn’t free of costs, monetary and environmental. And the same goes for ocean waves. So, will a forest of anchored buoys interfere with fish and migratory marine mammals? How can it not? Turns out that the concept of NIMBY (not in my back yard) is alive and well several miles offshore Oregon in the Pacific Ocean! People, everything has a cost. At first splash, power generating buoys seems more benign than most traditional or alternative energy sources. Say “Karlheinz Stockhausen” to most people, and, depending on your conversation partner’s degree of social etiquette, you’d be met by responses spanning the scale from quizzical stares to a smack in the jaw. Yr (Justifiably) Humble Svt’s interest in serious music has been documented in the space several times (among them: here, here, here and most hilariously, here). Yes, Karlheinz Stockhausen was a musician, a composer actually, and there was a time in MUDGE‘s young life when I was quite smitten with his ground-breaking compositions. Stockhausen was a pioneer of electronic music, at a time before Robert Moog made it simple to generate the complex sounds that have, thanks to Moog, become a ubiquitous feature of popular sonic culture. When Stockhausen began to chart a new course in European serious music in the early 50s, electronic music was pieced together, tone by tone, channel by channel, an agonizing arduous process. At one time, I had recordings of his music from that era, but I hadn’t encountered them for sometime before my vinyl collection was ceded to my musical MUDGElet No. 3. The classical music radio station in my town (and how many people can say that phrase these days?) never ever played Stockhausen’s music. Of course, they are hard-pressed to play music written after 1950, except that of John Adams, the Gian Carlo Menotti of this generation (i.e., feet anchored more in the 19th century than the 20th or 21st). So it’s been quite some time since I visited Stockhausen’s music. The obituary in the NYTimes tells us that his later life took a most Wagnerian turn. Anyone interested in the topic of serious electronic music can follow this link to the article in Wikipedia. So that’s today’s potpourri. We all remain hopeful that MUDGE‘s standard attention span returns real soon now. mm125: It <is> a serious music trifecta! When writing this good can meet with indifference from the hand that feeds, it’s all the more galling to see a dog of a script being thrown filet mignon. The glossy Euro-production Copying Beethoven barks, rolls over, and plays dead for two hours. It is a great example of that time-honoured genre, the biopic so silly it plays like a spoof. Try this: “My God, Beethoven, you’re even deafer than I thought!” says someone about one of the late string quartets. 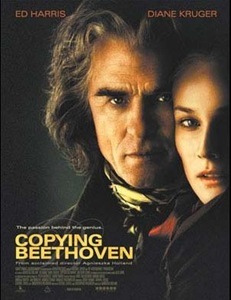 Or this: “Beethoven mooned me!” complains his put-upon female copyist, Anna Holtz (Diane Kruger). You won’t struggle to guess which sonata he was miming. I have to say, though, that it made a better impression on us, watching at home ($4.29 vs. $18.00 never hurts either). The centerpiece comes in the first hour: the performance, chopped, hashed, sliced and diced as it was arrayed in the film, of the 9th Symphony. It was compelling, not for one looking for an authentic, complete performance (although it was taken from a masterful one), but for the film’s depiction of its emotional affect on the listeners. There are moments in music that one would love to have a time machine available to go back to. And the first appearance of a massed choir is definitely one. Am I subjective about this? Of course. A lifetime ago, I sang in an amateur chorus (its amateurishness enhanced by my presence, alas). The near-whispering entry of the chorus in the last movement of Mahler’s 2nd Symphony (I’m certain that Beethoven’s 9th was Mahler’s inspiration). And the triumphant entry of the chorus in the 9th itself. You see them there, and even if you know the music, when they enter… there are fewer more sublime moments in life, much less music. …We have had very lively discussions on our forum with regard to authenticity, and Mr.Rivele has explained just how difficult this is to achieve on a limited budget. For example, did the violinists use chin rests? Did the cellos have tailpins? Did the horns have valves? What music would have been played in the taverns? There can be no doubting Mr.Rivele’s sincerity and desire to present a film covering the last years of Beethoven’s life as accurately as possible, but in order to create a viable project certain artistic licence has had to be taken. So, perhaps not the greatest film ever made with a musical subject (Amadeus, definitely an inspiration to the filmmakers, who respond with a similarly gritty depiction of 19th Century Vienna might get my vote), but atmospheric, weirdly (a female copyist?) believable, and often profoundly moving. Definitely worth the renting. And definitely odd that we should end up watching a film with serious music as its theme. Clustering. Then, in a rare DVD matinée, this afternoon we watched her next choice, the scenery chewing performances of Judi Dench and Cate Blanchett in Notes on a Scandal, which features a characteristically moody music score provided by another long-time favorite of this scribe, Philip Glass. I have fond memories of driving my little guy to summer camp every day when he was indeed little, five or six years old. All he wanted to hear on the car’s stereo was Glass’ score to Mishima, a film I never saw, because, really, I’m just not that interested in a fanatical Japanese guy who commits hara kiri to make a point, but the music is wonderful. So, it’s been about serious music for the past several days. And, BTW, I do consider seriously composed film music serious music. I’d go so far as to say, much of it has more of the qualities that audiences for so-called classical music are starved for: emotional content, a story, tunes. The Pulitzer-winning college professors who rule the roost in concert halls today (if you can find orchestras that play music written in the last 50 years), present their clangorous, academic, modern for the sake of modernity, scores composed for academic reasons (publish or perish, indeed). And, naturally, their off-campus audiences stay away. The film guys: Ennio Morricone, Jerry Goldsmith, Erich Wolfgang Korngold, even James Horner and Hans Zimmer, to slight very many others, speak to the audience directly and compellingly. And their best scores are eminently listenable, even if you never see the movie. Immersed as I’ve lately been in the pop soup of Pandora.com, it reminds me of what I’ve been missing that Cyndi Lauper, Mike Post, Paul McCartney and the like just aren’t providing. So, that’s the serious if not totally classical music trifecta. It’s been fun. Maybe we’ll do it again. You are currently browsing the archives for the Modern music category.